PennsylvAsia: The Beauty of Chinese Dance, April 28 at Carson Middle School. The Beauty of Chinese Dance, April 28 at Carson Middle School. 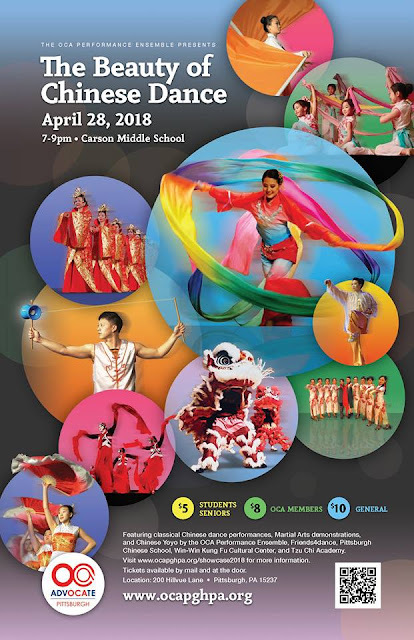 The Pittsburgh Chapter of the Organization of Chinese Americans will present The Beauty of Chinese Dance on April 28 at Carson Middle School. This special performance presented by the OCA Performance Ensemble features classical Chinese dance performances, Martial Arts demonstrations, and Chinese Yoyo by the OCA Performance Ensemble, Friends4dance, Pittsburgh Chinese School, Win-Win Kung Fu Cultural Center, and Tzu Chi Academy. Prices: $5 Students/Seniors; $8 OCA Members; $10 General. Tickets available by mail and at the door. Contact info@ocapghpa.org for more information. The performance runs from 7:00 to 9:00 pm. Carson Middle School is part of North Allegheny School District and is located in the North Hills suburb (map).